Last week here at the Scott Arboretum, gardener Lars Rasmussen taught a class about growing backyard fruit trees. Instead of focusing on the traditional crops of cherries and apples, Lars introduced us to a whole new world of delicious and beautiful trees that can easily be incorporated into our gardens and provide us with tasty treats come harvest time. Interesting backyard fruit trees are a great way to integrate edible plants into your garden. 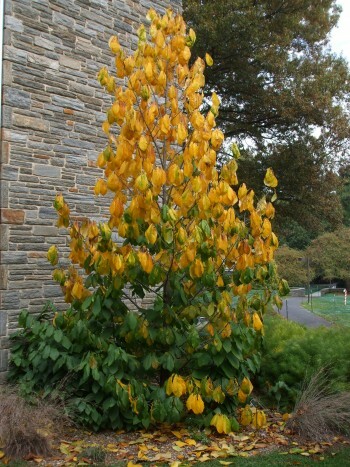 Asimina triloba, our native pawpaw, is an interesting plant for several reasons. This time of year, its yellow fall color is notable as it starts towards the top of the tree and works its way down toward the base. There are several pawpaw trees at Scott, with a small grove at the entrance to the Crum Woods by the Dupont parking lot. Pawpaws are also growing in the Crum Woods, but while it might look like there are several distinct trees in one area, these trees really form colonies. Pawpaw flowers are perfect, meaning that they have both male and female parts, but they are not self-pollinating or self-compatible, so they need to cross-pollinate with another unrelated pawpaw in order to bear fruit. And there aren’t too many pollinators up for the task. So many gardeners, determined to feast on the scrumptious pawpaw fruit, actually hand-pollinate their trees. And if you’ve ever tasted a pawpaw, you might decide that it’s worth your time. The fruit is the largest edible fruit in North America and is 3-6 inches long. When it is ripe, the skin is thin and soft. The class also focused on Diospyros virginiana and D. kaki (persimmons), figs, and Amelanchier (serviceberry), all of which have species and cultivars that grow well in Delaware Valley gardens. Here at Scott, there is a wonderful specimen of Diospyros virginiana, common persimmon, behind the Lang Center for Civic and Social Responsibility along Whittier Place. 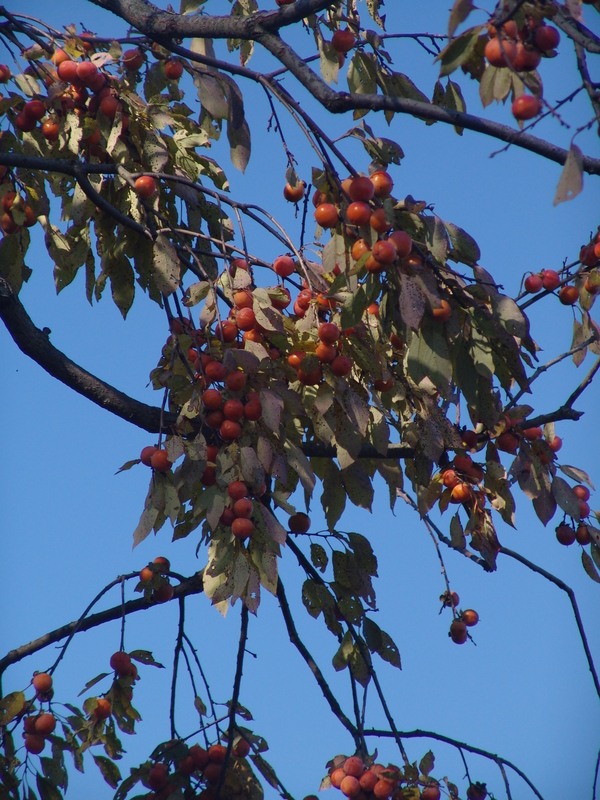 Last week, this native tree was in full fruit and had lost most of its fall color already. Lars used the fruit of this tree to bake us an incredibly delicious persimmon cake. 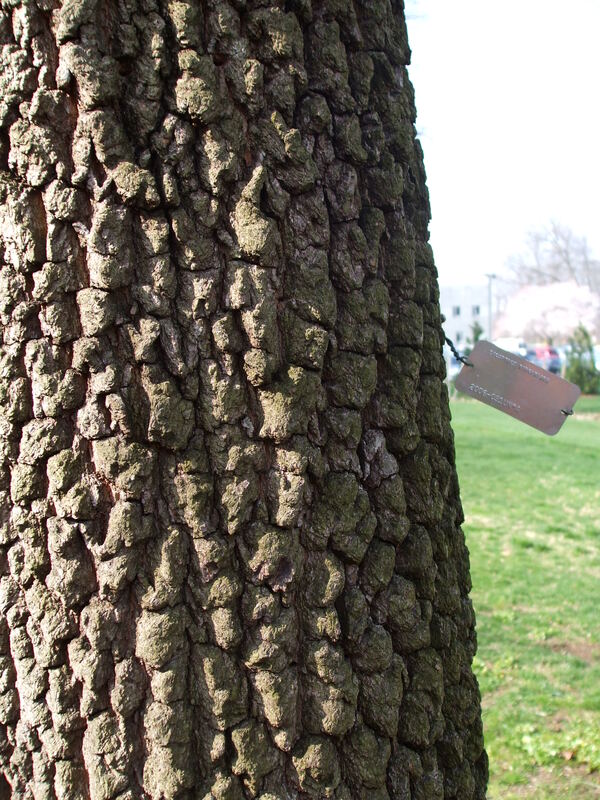 But I find the bark of this tree to be its best feature because it is grey, blocky, thick, and very striking. 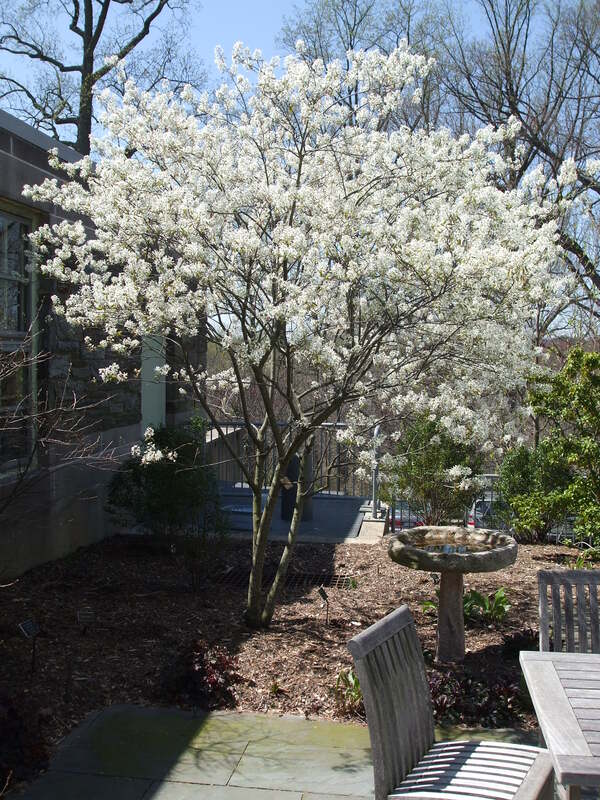 Two specimens of Amelanchier arborea ‘Autumn Brilliance’ are located in the Scott Arboretum Pollinator Garden. This serviceberry cultivar is deciduous and is between a large shrub and small tree at 15-25 feet tall. It flowers in early spring before the leaves appear and has showy, slightly fragrant white flowers in drooping clusters. The flowers become red berries in early summer and mature to dark purple. They are edible and sweet and are used in jams, jellies, and pies. I garden in Minnesota, in the Twin Cities area, and planted two pawpaw trees (Michigan seed source) about 7 years ago. One tree was trimmed by deer browsing and, at 2.5′, is less than half the size of the other. The large one produced many flowers this year and four fruits! There were no flowers on the smaller tree so it appears that, once in a while, a pawpaw will fruit without pollen from another tree. The fruits did not get very big before hard frost but two were edible–soft, creamy and sweet. I never expected fruit this far north; the trees are worth growing for their looks alone. Mary, would you please tell me which nursery you obtained your pawpaw trees from. I garden in St. Paul. Thanks. Same question – I’m looking to get some Pawpaws planted and I’m gardening on the West side of the cities… Thanks. We obtained our pawpaws from Pleasant Run Nursery which is a local wholesaler. But, if you are interested in a mail order source I would try Oikos Trees: http://www.oikostreecrops.com.